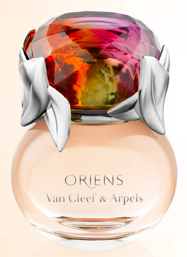 In 1976, Van Cleef & Arpels became the first jewellery House to create its own fragrance, aptly entitled First. And now comes Oriens, a new fragrance that pays perfect homage to the brand’s fascination and mastery over the Oriental aesthetics by evoking “the ever-changing mystery and magic of the exotic silk route to Asia”. Perfumer Bernard Ellena has peppered the chypre fruity floral fragrance with fleshy red fruit and transparent petals, giving it a sensual aura: Top notes of mandarin, raspberry and blackcurrant transport the senses into a garden where colours and light collide in thousands of different ways; while the heart of this olfactory journey promises another world, with notes of sunlight conjuring up an incandescent azure blue on the horizon. Jasmine petals overflow into a caress of voluptuous rain and, finally, majestic patchouli makes its appearance, enhanced with praline, developing in the base of the trail with a captivating air, like the legends of the Orient. The entire creation brims with opulence, “leaving a thousand suns in its wake, to keep the most treasured dreams sparkling forever”. And that’s not all. The bottle’s designer, Joël Desgrippes, modelled the flacon after a ring design from Van Cleef & Arpels’ fine jewelry collection: A mammoth tourmaline set in white gold, like a flower surrounded by diamond-studded leaves. Just like the colour of this precious stone, the colour of the bottle defies definition – throwing up a symphony of pink, red and green nuances that light up the skin with their iridescent facets. Truly a treasure worth coveting!